If anybody wants a PDF of the sheet or would like to host it on their website, please drop me a line at cynthia.spectrumgames@gmail.com. 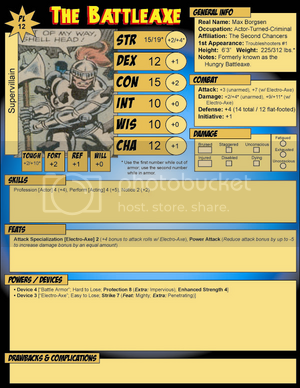 I'm posting a slightly modified version that I use for NPCs, with stats already included. Looks great Cynth, how does it look in B&W and/or copy? I created a b&w version too, as I don't think the one I posted would look good printed in grayscale. The kind words are much appreciated. I'm glad you like it. Look on the first page, under the July 17 entry. Thanks to Ms. Miller for letting me put them there. 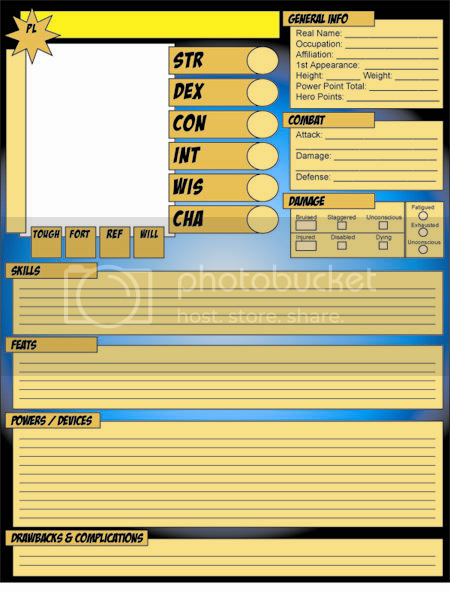 Any chance we can get this snappy looking sheet with fields built in that you can type into? I'm sorry, but there are no plans to make it fillable at this point. Such an endeavor is far beyond the realm of my abilities. You did a great job, love the lay out and your choice of colors. Thank you very much. I'm pleased with the overall result and I'm happy that you guys seem to be as well. Cynthia Celeste Miller wrote: I'm sorry, but there are no plans to make it fillable at this point. Such an endeavor is far beyond the realm of my abilities. I'll look into making the forms fillable for you. Okay, I made it editable and emailed a copy to your gmail account. Is the fillable form version available too? If I give you my email address could you email me a copy.